Just before Christmas, I had read in one of the many email newsletters I receive about this place that was due to be opening on Wardour St. I immediately emailed my Brunch buddy and we set a date. Unfortunately we couldn’t decide on a time that suited both of us so instead we decided to play it by ear. In the run up, the post Christmas strategy to loose weight kicked in and we toyed with the idea of amended what was meant to be just a boozy brunch to a yoga/meditation session, followed by brunch. This didn’t happen. Whist one of us made it to the gym, the other put it on hold until Sunday. I showed up at Jackson & Rye at 2.45 and expected it to take a lot longer to be seated. However the friendly waiter showed me over to a table quick enough for me to be seated by the time my Brunch buddy (BB) showed up 7 minutes later. I even had enough time to take a rather kool panoramic photo. The fact that my brother in law makes an excellent Bloody Mary means that 1) I’m thoroughly spoilt and 2) I know a good Bloody Mary when I taste one. On a scale of 1-10 I’d give this a 5. Whilst the ratio of tabasco/Worcester sauce to tomato juice was fine, the amount of seasoning was slightly lacking. 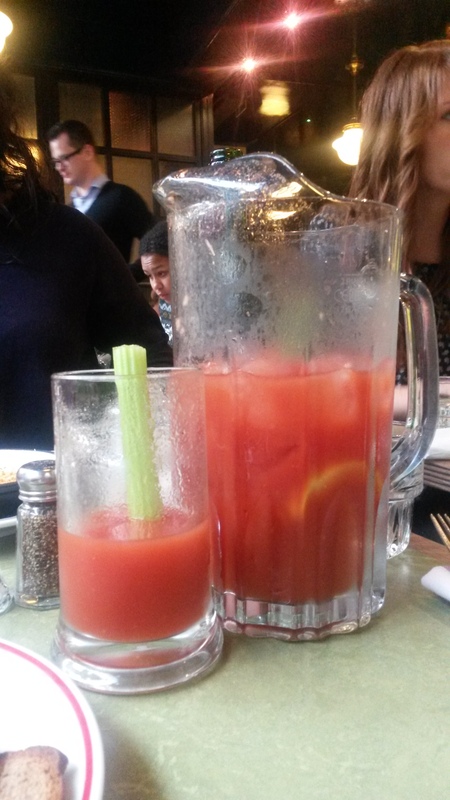 However with a good dash of salt and pepper and a stir, we finally ended up with the perfect Bloody Mary. After a few too many gluggs of Bloody Mary, we finally managed to catch the waiters attention to order our food. By this time we were both considerably hungry and had wasted enough time fluttering between food options. 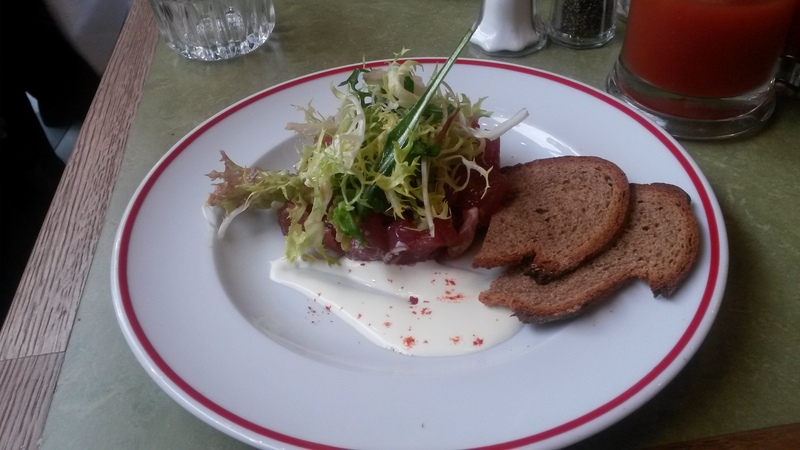 Our starters arrived after slighlty longer than I would have hoped, but my Chopped Raw Tuna, Smoked paprika & creme fraiche dish was worth the wait. The tuna tasted extremely light and you could tell it was very fresh, almost just out of the sea. The Creme Fraiche complemented the flavour in a way you wouldn’t imagine. 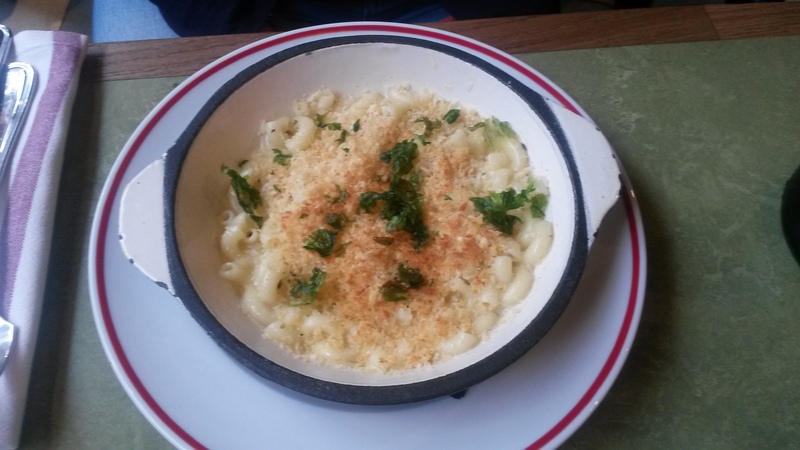 BB, despite having dragged herself to the gym that morning, opted for the altogether more comforting Truffled Mac and Cheese, rocket & parmesan. For the sake of my readers I had to give it a try and must say that despite the mix of pasta and cheese, it was also very light with a nice crumbly topping that finished it off well. The great thing about Brunch is that you’re essentially covering two meals in one. As you’ve skipped breakfast, you’ve all the more reason to simply pig out. BB & I are neither shy, nor do we like to go hungry, so we swiftly moved onto mains. 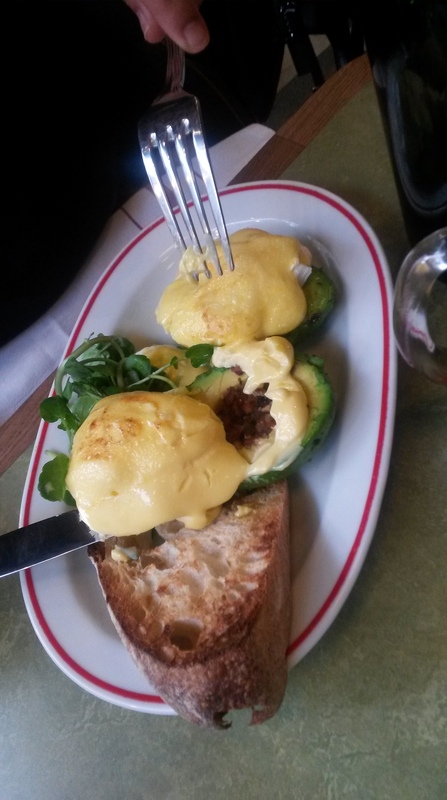 BB opted for the Avocado Benedict, poached eggs, bacon, hollandaise. When this arrived, the first thought on both of our minds were “they forgot the bacon”. 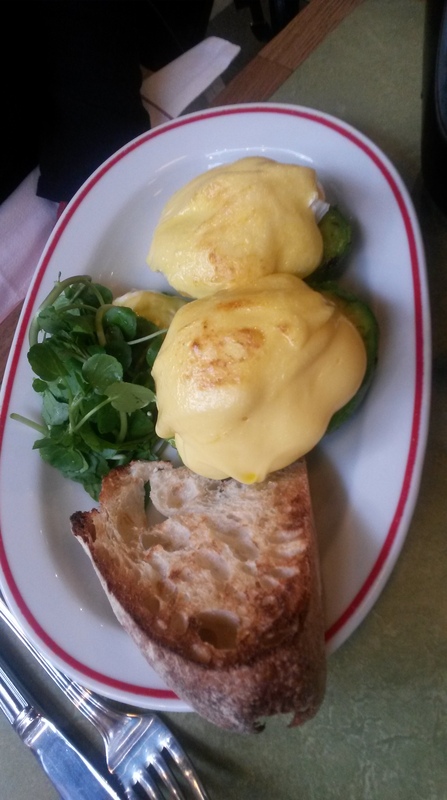 As you can see from the picture below, it was basically a full avocado, cut in half, destoned & skinned, topped with poached eggs and hollandaise. But given that this is a fairly new restaurant, it wouldn’t go down too well if they started forgetting bits of the dish. 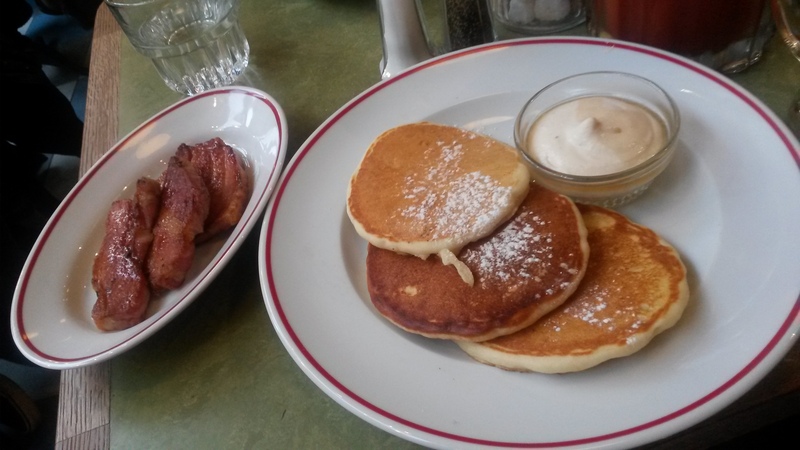 This time I went for the all american breakfast option, I chose the Buttermilk Pancakes, banana cream, maple syrup & slab bacon. Alas I must de-construct the dish. The buttermilk pancakes were light, fluffy, and rather delicious, only made better by the addition of the maple syrup. The banana cream was lovely to begin with, but as with most uses of banana essence, it got a little sickly after a few bites, so despite my love for fresh cream, there was still a full bowl left once I’d demolished the pancakes. Finally, what in the world is slab bacon, I hear you cry. Why of course, it is the thickest slice of bacon you may well have seen, but crispy on the outside and almost like pulled pork on the inside. Blooming delicious, I must say. To our excitement, shortly after my food arrived, we found the bacon, the cheeky buggers only went and hid it inside the avocado!! We quite happily gobbled up our brunch, complained of being extremely full and then scoffed a couple of lattes before realising it was 6pm and the lights had considerably dimmed since we walked in at 4pm. Not quite ready to settle in for dinner, we paid our extremely reasonable reasonable bill and wondered down Wardour street in a warm haze. Jackson & Rye is definitely the kind of place you can spend a whole day in, rock up for brunch, chat through the afternoon and then tuck into dinner. There was no pressure to leave, no mention of having to turn around the table and the lights pretty seamlessly dimmed, creating a constantly changing atmosphere that quite happily took us from afternoon to early evening and would have easily dragged us into night. Jackson & Rye, I will be back!